River Valley’s Jared Reese (left) leads South Gallia’s Gavin Bevan (center) and Eastern’s Blake Newland (right) during the 100m dash at the River Valley Open on Tuesday in Bidwell, Ohio. River Valley’s Savannah Reese (right) and South Gallia’s Maddie Little lead a pack of runners during the girls 100m dash at the River Valley Open on Tuesday in Bidwell, Ohio. BIDWELL, Ohio — Off to the races with many familiar names and faces. 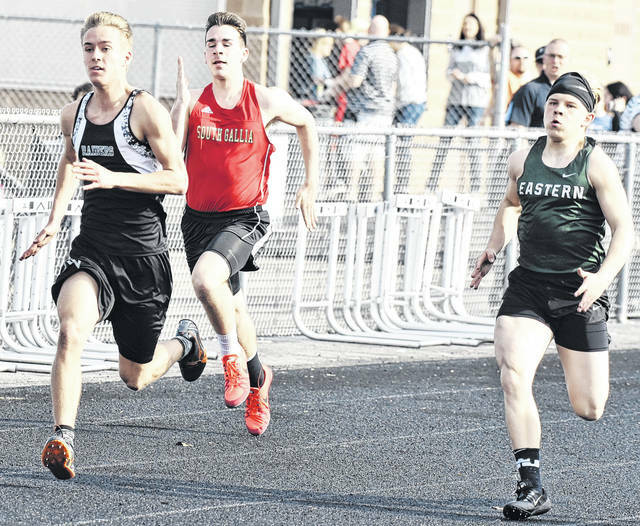 The River Valley Open was held on Tuesday night as track and field as the Silver and Black played host to two other Gallia County squads in the form of South Gallia and Ohio Valley Christian School, along with teams from Eastern and Southern from nearby Meigs County. RVHS came away with 35 top-three efforts, as Eastern and Southern reached double figures in top-three finishes with 21 and 10 apiece, respectively. 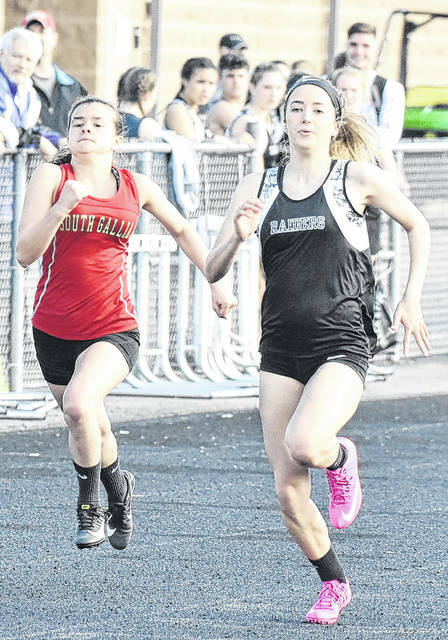 South Gallia followed with eight top-three finishers. On the boys side of the meet, River Valley’s Nathaniel Abbott was the winner of the 1600m run with a mark of 4:55.00, while Southern’s Larry Dunn captured second place with a time of 5:07.00. In the boys 300m hurdles, George Rickett of RVHS finished first with a time of 47.78, while South Gallia sophomore Justin Butler took second with a mark of 48.32. River Valley junior Layne Fitch completed the 200-meter dash (24.87) in first, while teammate Jared Reese captured third place with at time of 25.65. SHS sophomore Trey McNickle took home second place in the event with a mark of 25.00. Rory Twyman earned the top spot for the hosts in the 3200m run (12:28.00), while Chase Johnson captured the third position with a mark of 13:46.00. RVHS took the top two spots in the pole vault, as Jacob Edwards finished first (9-0) and Ethan Cline took second place with a mark of eight feet even. The boys discus throw again saw the hosts garner the top spot, as Eric Weber won with a distance of 129 feet and 1o inches. Eastern rounded out the top-three finishers in the event, as Tyler Davis was second (123-8) and Mason Dishong captured third (113-11). Davis also earned a first place finish for the Eagles in the shot put with a distance of 43-feet and four and three-quarter inches. RVHS junior Ty VanSickle (39-4) and Southern junior David Dunfee (39-0) rounded out the top-three in the field. The Silver and Black picked up two of the top-three spots in the 800m run, as Kyle Coen (2:16.2) placed second and Brandon Call (2:16.4) finished third. The River Valley quartet of Young, Reese, Burns, and Fitch earned a championship finish in the 4x100m relay with a time of 49.59, while Eastern’s relay team of Blake Newland, Noah Browning, Blaise Facemeyer, and Steven Fitzgerald took third place with a mark of 52.34. Young, Reese, Call, and Fitch earned another top performance for the Raiders in the 4x200m relay with a time of 1:43.8, while South Gallia’s squad of Sviatoslav Hryhorenko, Gavin Bevan, Kyle Northup and Butler (1:45.4) took third place. The 4x800m relay also went in favor of the hosts, as Coen, Abbott, Call, and Rickett clocked in with a mark of 8:59 to take the top spot. The 400-meter run saw RVHS junior Caleb McKnight (59.36) capture second place, while SHS sophomore Trey McNickle finished third with a mark of 1:00.46. South Gallia landed the top spot in the boys high jump as Kyle Northup took the event with a height of five-feet and eight-inches. RVHS sophomore finished second with a mark of five-feet and two-inches. The Rebels also landed an event champion in the 110-meter hurdles as Justin Butler captured the crown with a time of 18.76. River Valley rounded out the top-three as Noah Patterson took second (19.91) and Jordan Burns was next with a mark of 20.81 for third place. On the girls side, EHS senior Jessica Cook helped guide the Lady Eagles to five individual event wins with a pair of wins in the 400-meter dash (1:06.05) and 200-meter dash (29.57). Ally Durst set the pace in the 1600-meter run with a time of 5:51, while Layna Catlett won the discus throw (93-1) and Katlin Fick proved victorious in the 100-meter hurdles with a mark of 18.52. Fick also earned a second place finish in the pole vault with a height of seven-feet even and finished third in the 300-meter hurdles (58.52) and long jump (13-7), while Catlett finished second in the shot put (30-1). Rhiannon Morris took third in the 1600-meter run (6:25) and Morgain Little finished second in the long jump (13-9) to round out the top-three finishers for Eastern. The Lady Eagles won three relay events, as the quartets of Kylie Tolliver, Jaymie Basham, Little and Jenna Chadwell took the 4x100m relay (56.93), Rylee Haggy, Cook, Basham and Chadwell proved victorious in the 4x200m relay (2:02) and Durst, Morris, Ashton Guthrie and Alysa Howard finished first in the 4x800m relay with a mark of 11:57.8. The Southern girls earned three event championships as Baylee Wolfe earned first place finishes in the long jump (14-5) and high jump (4-10), while Sydney Roush won the 800-meter run with a mark of 2:48. Roush also captured second place in the 3200m run (13:51), while Mallory Johnson finished third with a mark of 2:56. Baylee Grueser’s throw of 80-feet even took third in the discus throw rounded out the top-three finishers for the Lady Tornadoes. The Lady Raiders earned four individual event championships as Alyssa Lollatin won the 300m hurdles (56.65) and Jenna Burke proved victorious in the pole vault with a height of eight feet even along with a third place showing in the high jump (4-2). Kelsey Brown took top honors in the shot put (32-10), while Kenzie Baker won the 320om run (13:07) to go along with a second place effort in the 1600m run with a mark of 5:52. Savannah Reese helped guide RVHS with second place finishes in the 400m (1:06.68) and 200m dash (29.95) along with a third place effort in the 100m dash with a time of 14.42. The Silver and Black also received individual second place finishes by Madison Tabor in the shot put (31-10) and Elisabeth Moffett in the discus throw (81-3), while the team of Britney Davis, Hannah Jacks, Sarah Moffett and Hanna Davis took second in the 4x100m relay with a time of 57.6. Sarah Moffett also earned a third place finish in the 400m dash (1:08.04), while Taylor Huck’s height of six feet even in the pole vault, Beth Gillman’s mark of 16:10 in the 3200m and Gabrielle Gibson’s effort of 19.77 in the 100m hurdles closed out the top-three individual finishers for the hosts. The South Gallia girls team of Alyssa Cremeens, Maddie Little, Jaslyn Bowers, and Olivia Harrison earned a third place finish in the 4x200m relay (2:08). The Lady Rebels has three individual top-three performances on the night, as Harrison took second in the 100m hurdles (19.57) and 300m hurdles (58.21) and Bowers finished third in the high jump with a mark of four feet and four inches. Ohio Valley Christian junior Chasity Deckard was the top female finisher for the Defenders as she finished sixth in the 110-meter hurdles with a mark of 21.36. The team results for the meet were not made available by press time.